Some have been physically abused. Others have suffered abuse emotionally. Some have undergone unimaginable trauma. And still others have experienced heartrending loss. Yet they survive. And they work to overcome paralyzing circumstances to move forward. 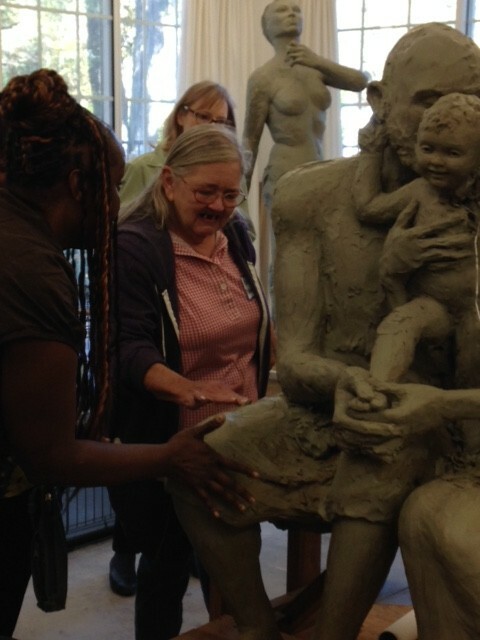 So when staff member Melinda Sullivan, who runs Sulzbacher’s Women’s Survivor group, was approached with the opportunity for some of the group’s members to spend a day of healing with locally-based artist and sculpter, Diane LaFond Insetta, at her stuidio, she didn’t have to think twice. She knew the results would be beneficial. A long-time supporter of the Sulzbacher Center with her husband, Victor, Ms. Insetta is perhaps best-known locally for creating the bronze eagles in Memorial Park in Riverside. While they enjoyed a light breakfast after they arrived, the women watched a video about the creation of the eagles that demonstrated how they were sculpted and the processes they underwent to be bronzed, transported and installed. As Ms. Insetta answered questions and shared a little about herself, she let the group know that she, too, had experienced significant hardships and challenges during her life. “We can choose to let the bad things that happen in our lives define us, or we can choose to be defined by the way we overcome those things. Only we have the power to decide how we want to live our lives,” she told them. The group then had an opportunity to add pieces of clay to a sculpture in progress, visit the artist’s gallery and work with clay and stone themselves. Lunch and more conversation followed. And that was the whole point of the day. A sincere thank you to Diane Insetta and her wonderful staff for making our women feel welcome, worthwhile and hopeful.